Polychrome Affinities is a collective exhibition of large-scale works by artists Guerra de la Paz, Michelle Weinberg and Magali Wilensky. The exhibition, curated by Michelle Weinberg, developed from a shared obsession among the artists involved with sorting elements from the visual environment according to color. Expressing her conception for the exhibition, Weinberg describes the artists as "magpies, scavenging elements from the visible world" and then filtering them through a deep, passionate involvement with color. The public scale of the works transforms the exhibition space into a vibrant, larger than life theater set, a veritable rainbow plaza. Visitors enter and exit the elevators to the second floor through Weinberg's 16' x 40' mural on canvas depicting an imaginary plaza or strip mall inspired by Miami's storefronts and building facades. 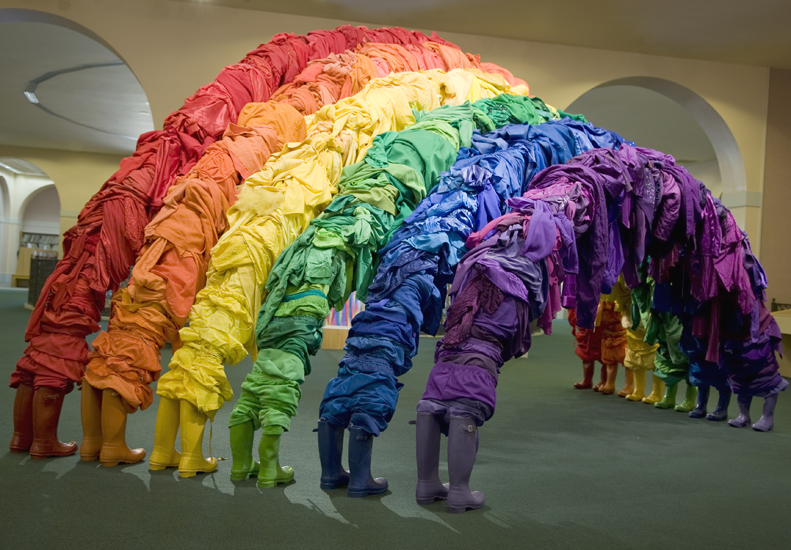 Guerra de la Paz has erected a vast arch assembled from found articles of clothing in colors of the rainbow. 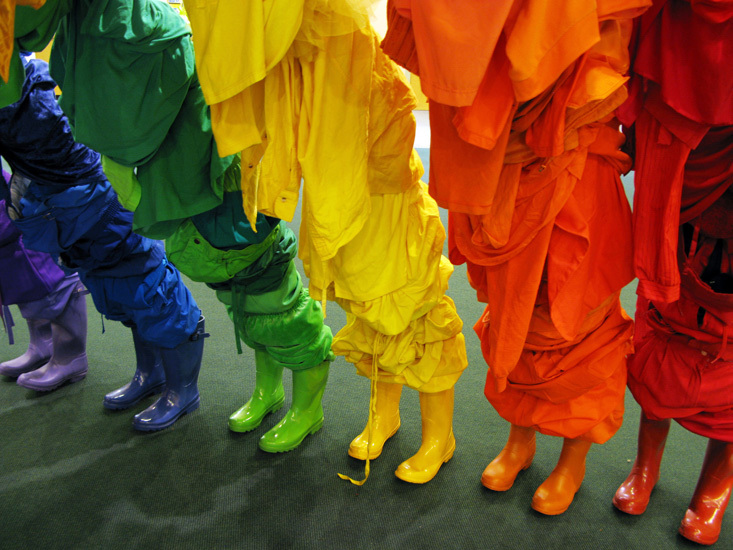 Titled Indradhanush, it expresses the spiritual power the rainbow in humanist terms. 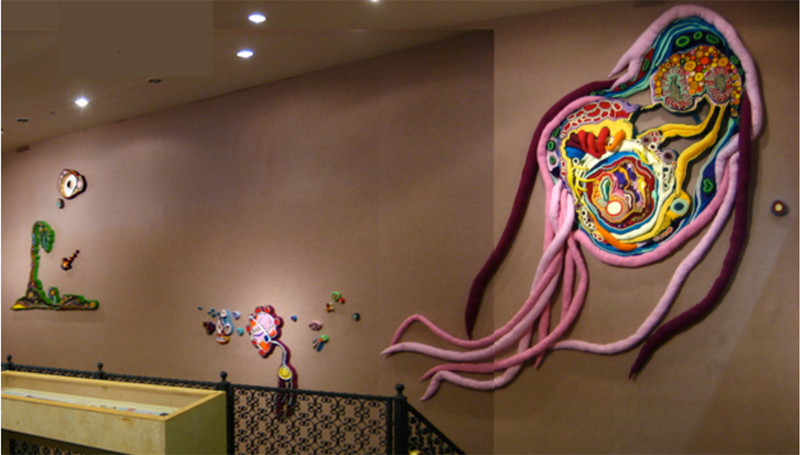 Ascending the staircase to the second floor are low relief sculptures of organic, possibly cellular forms by Wilensky, formed by rolled and sewn fabric remnants. They are microorganisms rendered here at the scale of spectacle. Weinberg's planes, facades and building elevations, Guerra de la Paz's castoffs and costumes, and Wilensky's slivers of anatomy all act as "cross-sections" or slices of reality, stylized interpretations with symbolic resonance. All the artists are stimulated by exhibiting their works in public places such as the library. Artifacts, meaningful ephemera, swatches of materials, sketchbooks, related books in the library's collection, and source images are exhibited near the exhibition to share a behind- the-scenes look at the artists' creative processes. Helen Kohen, former Miami Herald art critic, and presently Director of the Library's Vasari Project, has contributed an essay on Polychrome Affinities which appears in a takeaway printed poster available to visitors in the gallery. 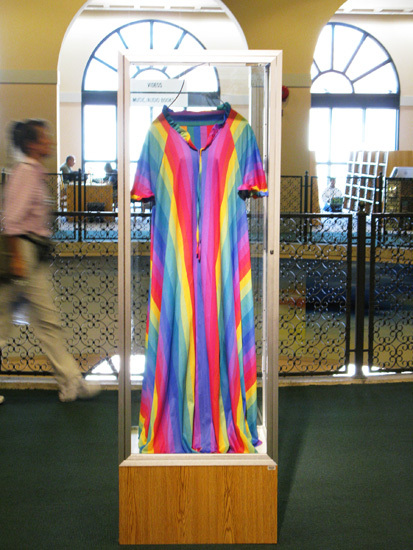 She comments, "Having siphoned their creative energies from the real world, the artists responsible for the artworks in Polychrome Affinities have temporarily transformed the "Quiet, please" of the library's ambience into an animated world. The space nonetheless feels comfortable, slightly folkloric, familiar. It is as if Guerra de la Paz, Weinberg and Wilensky have crisscrossed the exterior plaza, scaled the walls of the structure's elevation, and brought the outside, inside." “This has been my ideal kind of project,” says Library Curator Denise Delgado. “It’s the result of a collaborative process between the library and the artists, with work made specifically for the space. It’s exciting to see people respond to the transformation.” Along with site-specific projects like Polychrome Affinities, the Library’s Art Services and Exhibitions Department curates a year-round program of exhibitions, performances, lectures, and discussions, and maintains a special collection of over 2,200 works of art that are installed throughout the Library System. Main Library will host a reception and artist talk for Polychrome Affinities on Thursday, November 13 from 6:00-8:30 pm. All exhibitions and events are free and open to the public. about the artist: Guerra de la Paz is the composite name that represents the creative team efforts of Cuban-born artists, Alain Guerra and Neraldo de la Paz. What began as an idea for two individual artists to share a working studio in Miami's Little Haiti, has become an ongoing collaboration that has evolved into constant experimentation, manifesting into a body of work that spans over eleven years in a variety of formats. The recipient of the 2008 SCOPE Foundation Grant for artist project “Under the Banyan Tree,” they are are represented in the Saatchi Collection (London), 21C Museum Foundation (Louisville, KY), Frost Art Museum (Miami, FL), Miami Art Museum (Miami, FL), and The Cintas Fellows Collection. about the curator: Michelle Weinberg depicts a vivid, contemporary folklore by reconfiguring banal urban spaces and everyday images into theatrical and devotional arrangements. Architecture, typography, decorative arts and the theatre inform her shifting pictorial spaces. Some works are inspired by the eccentric paint applications on Miami’s warehouses. Her forays in design and public art are a natural extension of her work in the studio. Weinberg is the recipient of fellowships and residencies from Fundación Valparaiso in Spain, Millay Colony, MacDowell Colony, an Artist Enhancement Grant and an Individual Artist Fellowship from the State of Florida, a 2008 South Florida Cultural Consortium Fellowship in Visual & Media Art, the National Foundation for Advancement in the Arts, the Fine Arts Work Center in Provincetown, Altos de Chavon (Dominican Republic), and Eastern Frontier Society (ME). Exhibitions include The Schoolhouse Gallery in Provincetown, David Castillo Gallery, Art@Work, Casa Lin, Miami Contemporary Artists: Creating a Scene, Bernice Steinbaum Gallery, and ArtCenter/South Florida. 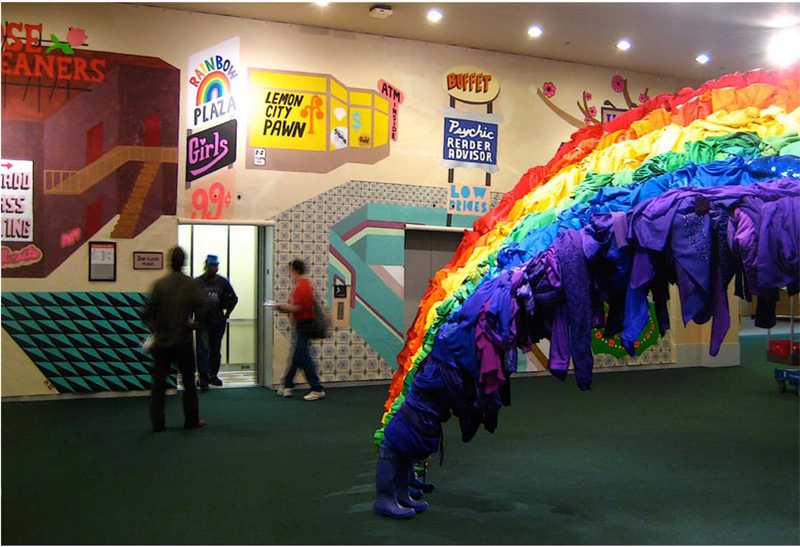 about the gallery: Miami Dade Library System’s Art Services and Exhibitions Department curates a year-round program of exhibitions, performances, lectures, panel discussions, and community art projects. All of these are free and open to the public. We also maintain a special collection of over 2,200 works of art. The collection includes works on paper, photographs, artists’ books, and small sculptures, with a focus on African American, Latino, and Miami artists. Additionally, the Vasari Project is an archive that documents the development of the visual arts in Miami-Dade County since 1945. It contains correspondence, press clippings, photographs, oral histories and other materials. The public may access both of these collections for research and reference.